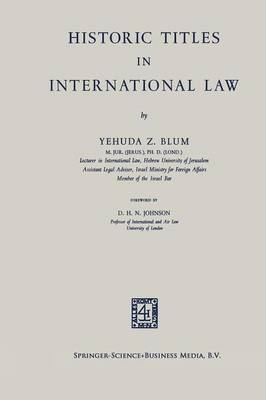 The question of Historic Titles in International Law has been much discussed in recent years. In particular, it was an issue of some im- portance in several international arbitrations, such as the Gulf of Fon- seca case, decided by the Central American Court of Justice; the Island of Palmas case, decided by Judge Huber as sole arbitrator, under the auspices of the Permanent Court of Arbitration; the case concerning the Legal Status rif Eastern Greenland before the Permanent Court of International Justice; and, more recently still, the cases concerning Fisheries (United Kingdom v. Norway); Minquiers and Ecrehos Islets (U nited Kingdom v. France) ; Certain Frontier Land (Belgium v. N ether- lands); and Temple rif Preah Vihear (Cambodia v. Thailand), before the International Court of Justice. Historic Titles are probably also a re- levant factor in a number of territorial disputes that have not yet been submitted to arbitration or judicial settlement. The recent controversies over the proper breadth for the territorial sea and the exclusive fishing limits of coastal States have brought to the fore new aspects of the problem.